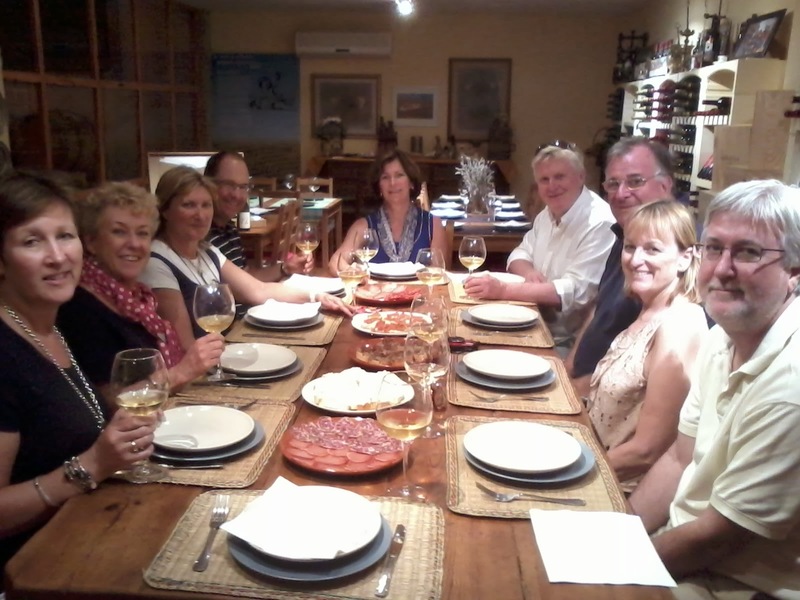 One of the tours I ran last week was a wine tour to the Ronda area with a group of 9 Australians. At both the wineries we visited wine production was in full swing. In the first photo below, you can see boxes of grapes that have just been brought in from the vineyard. In the second photograph whole bunches grapes are being trodden, which is a rare occurence these days. The idea is not to crush the grapes but to press them together to remove as much air as possible. These grapes will then undergo carbonic maceration which will result a very fruity wine. This wine will eventually be blended with other wine made with destemmed grapes. We tasted a number of wines at this winery with a sweet red wine being the most interesting. The grapes used to produce it were partially dried in the sun before pressing to concentrate the sugars. Everyone thought is was superb. The photo below shows Antonio, the winemaker, serving the sweet red to the group. At the second winery, as well as doing a normal visit we sat down to a fantastic lunch with 4 different wines from the winery being served throughout the meal.